High speed USB2 5M active repeater extension cable. 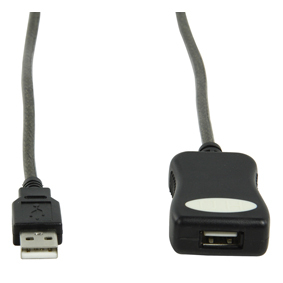 USB cables loose power when you go further than 5m, this active cable amplifies the signal. You can carry the signal upto 25m by joining 5 of these cables together. Supports Windows 98SE, ME,2000, XP, Vista, 7 and IMAC 3, G3, G4 on Mac os V9 or higher.